Crawley Town remain unchanged for their match with Oldham Athletic. Manchester United loanee Matty Willock remains on the bench as Reds will look to extend their run of two unbeaten games. Oldham make one change with Peter Clarke coming into the side for Mohamed Sylla. Crawley Town come into the game in great form, picking up four points from the last two away games. Their last home game saw them lose 1-0 to Port Vale. The Latics have lost their last three matches 2-1 to Doncaster, Macclesfield and MK Dons. Pete Wild is still in charge as caretaker manager of the visitors with Paul Scholes expected to be announced as the new manager soon. 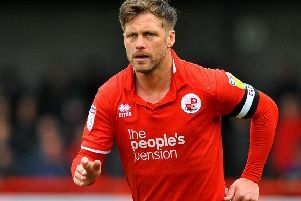 But the former Manchester United midfielder is not in attendance at The People's Pension Stadium despite being expected to be here. Crawley: Morris, Young, Payne, McNerney, Palmer, Gambin, Francomb, Dallison, Sesay, Morais, Camara. Suns: Mersin, Poleon, Nathaniel-George, Maguire, Willock, Bulman. Oldham: Iverson, Hamer, Edmundson, Clarke, Stott, Missilou, Maouche, Lang, Neopmuceno, Branger-Engone, Vera. Subs: de la Paz, Baxter, Taylor, Dearnley, Benteke, Sylla.